Buffer sites will pass strong juice from layers below them straight to your main site. Extremely safe technique because you are not getting a large number of links directly to your site but quality contextual backlinks from high DA web 2.0 properties with unique content related to your niche. Complete excel report with live links and logins (mail, username, and password). Order with service extras for handwritten contents and more web 2.0 blogs. 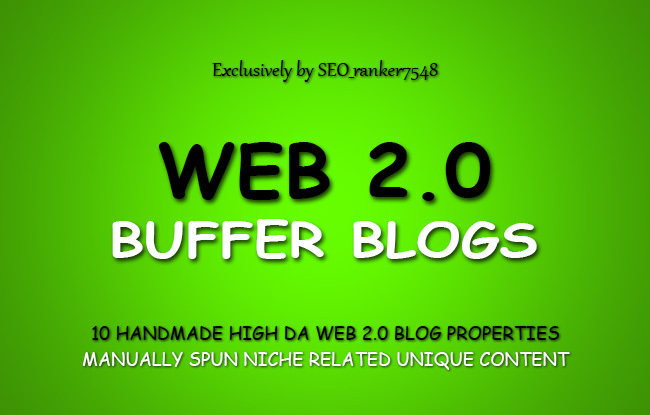 10 Handmade Web 2.0 Buffer Blogs with Login, Unique Content, Image & Video is ranked 5 out of 5. Based on 5 user reviews.